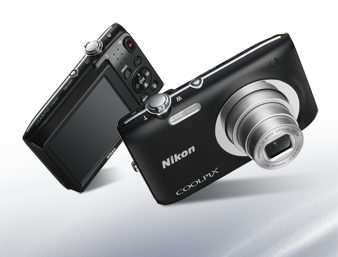 Lithium-ion powered with stylishly slim design - genuine COOLPIX satisfaction is within your grasp. 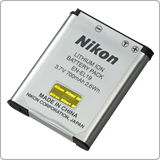 The Lithium-ion battery is light, compact, and can be recharged over and over. More eco-friendly than alkaline and more energy efficient than Ni-MH batteries, it will help you enjoy more photography while saving cost over the long run. While the slender 19.5 mm body makes COOLPIX S2600 a pleasure to carry, you can count on the 5x NIKKOR lens with 26 mm wide-angle coverage* to seize any moment with beautiful results. Take group shots with everybody in them, and pristine close-up shots from far away, with assured optical quality. Within its slim dimensions you'll find the quality features that COOLPIX is renowned for. High picture quality has a sure footing with the 14.0 effective-megapixel CCD image sensor. Electronic VR image stabilization helps to minimize image blur whether zoomed in or out. And upgraded auto noise reduction offers superior results in low light situations. Scene auto selector frees you to focus on your composition in varying situations by automatically choosing the best scene mode for the setting in which you are shooting. Motion detection and Subject tracking follow the movement of your subject to help deliver clear results even if your subject moves around. Note : Images shown on this page are simulated.